Human’s are social creatures and the moms of the world are no different. The phenomenon of clique’s among mothers is one of natural preexistence and presents an untapped channel filled with consumer insights, genuine influence and a feeling of camaraderie. 1. Brands that build safe communities foster open dialogue, granting the sponsor a ‘fly on the wall’ perspective of the needs, wants and concerns of the target segment. This helps in not just MarCom’s but also product development. Customers that gave input in the creation of a product are more likely to take ownership of it, which helps spread the word in the Go-to-Market stage of its launch. Genuine word of a mouth and “I made that” go hand in hand. 2. Before the internet, the right to review a book was locked to a few publishers. Amazon changed all that by giving its community the power to rate books. With time, reviewers scrambled to achieve the coveted Top Reviewers badge of honor. In the same way, building an online community allows brands to reward its visitors for adding value to discussions and being influencers. 3. A community that has rallied around a product is more likely to be ready to help the community sponsor with influencer marketing. This saves the sponsor and its agency the time taken to find new influencers, granting instant access. Enough theory, here’s how we applied this for our clients. 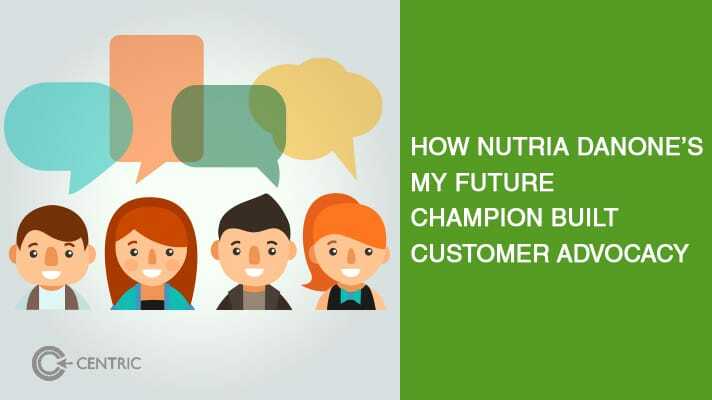 In order to bring together the moms in the Middle East and introduce science backed ideas on raising children in their formative years, Nutricia Danone’s Aptamil launched My Future Champion, a community by moms and for moms all about their children. The in-person events involved moms and their children, with activities aimed at building knowledge for the latter’s formative years. With the help of Centric DXB, they launched My Future Champion online just for Middle Eastern moms in the Middle East with personalized online experiences and advice for first-time moms in the United Arab Emirates, the Kingdom of Saudia Arabia, Qatar, Kuwait, and in Lebanon. More than just a platform offering consumer insights, the community of Nutria Danone’s My Future Champion brings together moms across the Middle East to talk about themselves and their children, share their life experiences, comfort one another through tough times and be the support system most yearn for. Deep within the private groups, message boards and subgroups on Nutria Danone’s My Future Champion, moms of the Middle East socialize with not just each other but also reps from Aptamil, the community sponsor. The success lies in empowering the moms with ownership of the brand, asking them what they want out of the look, feel and functionality of Aptamil, thereby making the moms an extension of the brand. As brand leadership continues to look for ways to get more out of their investment, we will see more brands creating consumer communities with moms. When done right, it provides easy and direct access to insights, deeper relationships with social influencers and cost-savings to bringing innovative products to market. To take this impact to a higher level, this week My Future Champion launched an educational games section so moms and their children can spend quality time together with skill development that keep track of their progress. We recognize that everyone is looking to tell a story about themselves and great brands make that happen in droves. With My Future Champion, Nutricia Danone gifts moms with an open space for dialogue and discussion, forging connections and relationships that transcend geographies, fostering communities.